10 fresh seeds are in this pack. The Jaboticaba (also called Jabuticaba or Brazilian Grape Tree) is a very unusual tree native to Brazil whose fruits are formed directly on the trunk and branches. 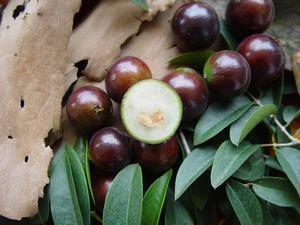 The grape or even lychee tasting fruit has a thin astringent purplish black skin, with a sweet white fleshy pulp and can be eaten fresh or be used to make jellies and drinks (plain juice or wine). In heavy soils the roots may rot - plant on a mound and/or incorporate a lot of organic material into the soil before planting in clay soils.